Credible information gathered by The Chronicle newspaper indicates that Former President, Flt. 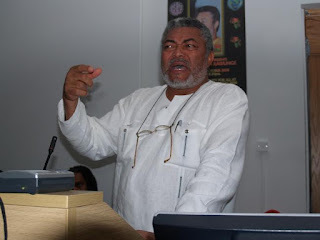 Lt. Jerry John Rawlings would not honour the invitation extended to him by President John Agyekum Kufuor to join in the celebration of the country’s jubilee anniversary scheduled to take place on March 6, this year. According to sources close to the Former President, he is likely to turn down the invitation due to the soured relations existing between him and the incumbent government, coupled with the accusations that he has left a messy legacy and that he’s soliciting for funds and support to topple the ruling government and many others.This would obviously shatter the hopes and aspirations of most Ghanaians, who would have wished to see the two leaders on the same platform, especially during this historic Jubilee anniversary of Ghana’s independence to chart a new course for unity and reconciliation.This paper has gathered from the grapevines of both the leading members of the National Democratic Congress (NDC) and sources close to the office of the former President that though the NDC founder would have loved to attend the gathering, various comments have come up for a second thought and consideration.According to the sources the questions being asked are whether or not the invitation to Mr. Rawlings, who was accused of being a serial coup maker in addition to recent allegations by the President, Mr. Kufuor to the effect that he (JJ) had solicited for funds from an oil-rich country to topple the current administration, should be taken seriously.Considering his reservations about how he was ignored at all State functions, over the period, including being ignored at a dinner in honour of President Laurent Gbagbo of Cote d’Ivoire in 2001 by President Kufuor, Mr. Rawlings is said to have contemplated deeply on whether or not to join the President to celebrate Ghana @50 at the time that Mr. Kufuor continues to accuse the NDC administration that he led of leaving a messy legacy for the NPP to inherit.Another major sentiment the former President is reported to be agonizing over is how the first President, Dr. Kwame Nkrumah, has been completely shoved aside, and his name not being made to occupy where he belongs in our history by the current administration. According to our sources, Rawlings is angered that in a Jubilee State of the Nation Address, Dr. Nkrumah’s name did not come up at least once in the address.“All monuments are rehabilitated but Nkrumah’s monument is completely left out; even his mausoleum has been left and government is rather asking for donation of $2m with donors’ name being inscribed on the mausoleum.If even the founding father has been so shabbily treated, is it any wonder that Mr. Rawlings, who led us for nearly 20 years has been completely ignored,” a party member told this paper. 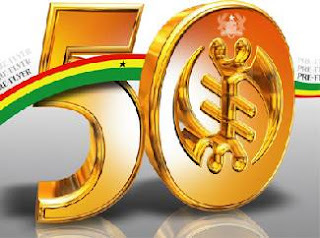 Besides other reasons why the NDC founder would turn down the invitation, this paper learnt was how he was not invited to take part in one of the major programmes outlined for the Ghana @ 50 celebrations - the lecture by Mr. Kofi Annan, the former UN Secretary General and above all, the late invitation at a time all other heads of state had been invited ahead of schedule.